ST. GEORGE — A Utah man is dead after reportedly drowning while trying to swim into a cave located behind a waterfall on the Havasupai Reservation. The man’s death was the second reported drowning in the area over the Memorial Day weekend. At approximately 3 p.m. Monday, the Coconino County Sheriff’s Office received a request from the Bureau of Indian Affairs in Havasupai to assist in response to a possible drowning at Beaver Falls, the Sheriff’s Office said in a statement Tuesday. A man reported to tribal officials that 36-year-old Mark Magleby, of Orem, was camping with him and a group of their friends and that Magleby had attempted to enter a cave behind the falls, according to the statement. A sheriff’s deputy was transported by Air West to the falls to coordinate rescue and recovery efforts with tribal officials. By approximately 7 p.m., Magleby’s body resurfaced and was recovered. The body was transported from Havasupai by Department of Public Safety Ranger Helicopter to the rim where transfer was made to the Coconino County Medical Examiner’s Office. Havasupai officials reported that more than 250 individuals were registered for use of the area that day. Magleby’s death marked the second drowning in Coconino County during the Memorial Day weekend. An 18-year-old man identified as Kevin Anaya, of Mesa, Arizona, drowned at Lake Mary south of Flagstaff, officials reported. At approximately 3:30 p.m. Saturday, officials near the Lake Mary boat ramp were flagged down by individuals reporting that Anaya had been swimming near buoys located south of the boat ramp before disappearing in the water. Deputies from the Coconino County Sheriff’s Office and US Forest Service Law Enforcement responded to the scene and entered the water in an attempt to locate Anaya. These initial response units were supplemented by response from the Coconino County Sheriff’s Office Search and Rescue, Flagstaff Fire Department and a Department of Public Safety Helicopter. “Several citizens who were in the area also assisted with the search efforts by providing the use of their boats,” the Sheriff’s Office said in a statement. 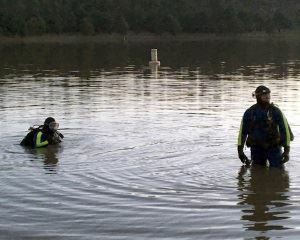 At approximately 9:30 p.m., members of the Sheriff’s Office Dive Team recovered Anaya’s body in close proximity to where he had last been seen.